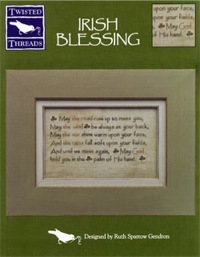 Twisted Threads opened the doors to our retail shop 20 years ago, on May 8, 1993. It has been the dream of my life to bring stitchers together to be creative, share their passion, and become friends. I love what I do, and just wanted to say thank you to everyone that continues to be part of Twisted Threads and our journey. Thank you to the women who were part of the retail store in Madeira - Stasi, Pam, Marcia, Brennie, Tracie, Mary, and everyone that worked in our shop. Thank you to every stitcher who walked through our doors and became a friend! Thanks for hanging out with us, with both laughter and tears. And, thank you to every one who has ever purchased one of our designs, as well as our distributors, and all of the shop that sell our designs. 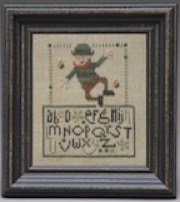 Celebrate March with one of our designs perfect for the Irish in ye! We have had so many requests for directions on mounting needlework for our tin frames, that we have added a pdf file in our missives section! Even though this document illustrates mounting in our 1" x 3" frame, it works for any of our tin frames! Our frames are available through your local needlearts shop! Please check our shop listing for a retail shop in your area. Most of them have websites, email, and toll-free numbers. If they do not have our frames in stock, they will be glad to order them for you! 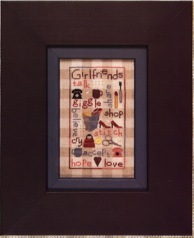 Gingham Girlfriends is now available!